The Dioceses of Northwestern Pennsylvania and Western New York are considering a shared future that includes the possibility of sharing a bishop for the next five years. Here are answers to some frequently asked questions about the process. Download FAQs as a PDF. What is the proposal under consideration? At our diocesan conventions, Bishops William Franklin of Western New York and Sean Rowe of Northwestern Pennsylvania, along with the presidents of the respective standing committees, proposed that we spend the next year convening discussions among leaders across our region about how we might create more opportunity for mission by working together. This process will culminate in October 2018, when our dioceses will hold a joint convention in Niagara Falls to consider their futures. If our discussions in the next year are fruitful, as we hope they will be, we would anticipate that in October 2018, the Diocese of Western New York would elect Bishop Rowe as its bishop provisional for five years beginning in April 2019, when Bishop Franklin retires. During the first three years of the partnership, our two dioceses would work together to deepen our relationships and develop shared mission priorities. In October 2021, we would re-evaluate the partnership and then, in October 2024, decide whether we wanted to continue it beyond the five-year mark. What is a provisional bishop? A provisional bishop is a bishop, either retired or already serving in another jurisdiction, who serves as the bishop of a diocese during a vacancy. In some instances, dioceses choose a provisional bishop arrangement because they are not yet ready to undertake the search process. The Diocese of Western New York could undertake such a process, but is considering electing Bishop Rowe as its provisional bishop to explore a deeper relationship with the Diocese of Northwestern Pennsylvania. The retirement of a bishop requires any diocese to engage in a process of reflection and prayerful self-evaluation as it determines the qualities it seeks in a new leader. In this instance, the strong relationship between Bishops Franklin and Rowe, the similarities of the challenges and cultures of our two dioceses, and the urgent need for the Episcopal Church to experiment with new ways of organizing and energizing itself for ministry suggested some creative possibilities worthy of exploration. Dioceses across the church have too much overhead, too few resources to devote to mission and too little experience cultivating deep collaborative relationships with other dioceses. We have an opportunity to change that. What decisions have already been made? No decisions have been made. We are in hopes that the Diocese of Western New York will elect Bishop Rowe as provisional bishop and explore a deeper relationship with the Diocese of Northwestern Pennsylvania on the timeline described in the first answer above. However, before Bishop Rowe can stand for election, the Standing Committees of both dioceses must consent. Their consent does not resolve the matter. The Diocese of Western New York can decline to elect Bishop Rowe at the joint convention scheduled for Niagara Falls in October of 2018, and initiate a search for a new bishop. If Bishop Rowe is elected as provisional bishop, the arrangement will be reviewed as described in the first answer above. What steps in this process have already been taken? Bishops Rowe and Franklin and their standing committees have had extensive conversations to consider whether to advance this proposal. It was first shared publicly at a joint clergy conference in Chautauqua, NY, on September 15-16. On October 8-9, some 44 people, drawn from the lay and clergy leadership of both dioceses, gathered in Erie for a process known as “compression planning.” Working in small groups and plenary sessions, they raised scores of questions, identified specific concerns and discussed numerous opportunities presented by the proposal to share a bishop and deepen the relationship between the two dioceses. In 2018 members of the two dioceses will have an opportunity to discuss the proposal and explore the possibilities in a deeper relationship at listening sessions. Working groups including members of both dioceses will be formed to explore various issues raised by the collaboration as those issues become clear. What changes will take place if Bishop Rowe is elected? If Bishop Rowe is elected, he will exercise the same authority in the diocese that Bishop Franklin and his predecessors did. He will maintain offices in both Buffalo and Erie and make visitations in both dioceses. Elected leaders in both dioceses will continue to exercise their canonical functions. Each diocese will send a deputation to the 2021 General Convention. Each diocese will maintain its cathedral. Other changes may unfold after a period of exploration and discernment. What are the advantages of sharing a bishop? To begin with a practical concern: the move will save money by reducing overhead and streamlining operations. Western New York, for instance, will not have to spend the $150,000 to $200,000 associated with the search for a new bishop. Spending less money on overhead means we will have more money for mission and more capacity to help our congregations. Because our diocesan and regional cultures are quite similar, and because we face similar challenges, we believe we can be natural companions in ministry, sharing resources, information and wisdom to help build the church and serve our communities. Together, we’d have opportunities to collaborate on building Episcopal institutions like schools and ministry centers. As we explore this relationship more deeply, other opportunities might emerge. Rust Belt people are not a prideful bunch, but it’s not too much to say that through this partnership, we have a chance to show the church one path out of its institutional malaise by demonstrating how deepening relationships and careful reorganization can refocus our energies on mission, evangelism, pastoral care and spiritual development. What are the possible outcomes of this process at the end of the five-year period suggested in the proposal? The process itself will flesh out possibilities for shared ministries and creative collaborations. 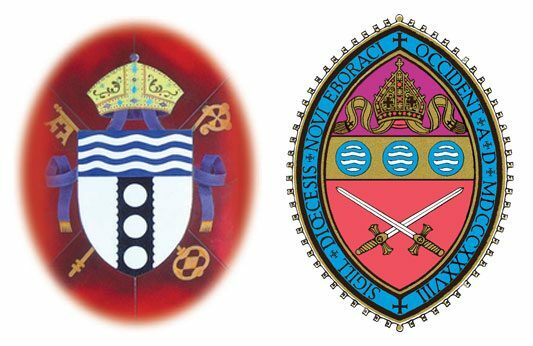 In terms of diocesan governance, the possibilities include, but are not limited to: returning to the previous status quo of two bishops and two dioceses; maintaining two dioceses but with a single bishop and some shared administrative services and ministries; combining to form a single diocese. Are there legal and canonical impediments to this proposal? No. There are no legal or canonical impediments to electing a provisional bishop who also has jurisdiction in another state, nor in another province of the Episcopal Church. If the dioceses move toward shared or combined governance, they will consult with legal experts and the three existing dioceses (Central Gulf Coast, Rio Grande and Spokane) that span two states, and the Church in Navajoland, which exists in three states. How will we have input as the process moves ahead? Following the diocesan conventions, Bishops Franklin and Rowe are planning a series of conversations and meetings in both dioceses to get feedback, answer questions, and hear concerns. The bishops and diocesan leaders, including members of the Standing Committees and councils, will be available throughout the process to receive feedback and answers questions.